The new Special Edition trim is available on either the front-wheel or all-wheel drive versions of the Pilot, and it adds Pewter Gray aluminum wheels, a power moonroof, a rear seat entertainment DVD system and Sirius XM radio. Prices come to $33,950 for the two-wheel drive version, after the $830 destination charge, or $35,550 for all-wheel drive after destination. Prices for the rest of the trims are up $200 over last year, and they all still come standard with remote entry, a rearview camera and Class III trailer hitch. Power is still provided by a 3.5-liter V6 with 250 horsepower and 253 pound-feet of torque with a five-speed automatic. Fuel economy is unchanged as expected with front-wheel drive models rated at 18 miles per gallon city, 25 mpg highway and 21 mpg combined, and four-wheel drive models make 1 mpg less at 17 mpg city, 24 mpg highway and 20 mpg combined. Scroll down to read the official release. 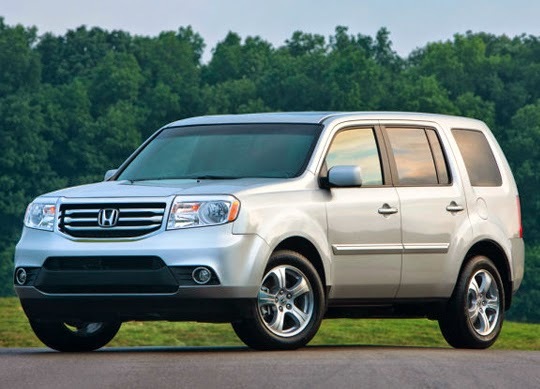 TORRANCE, Calif., With the new Special Edition (SE) trim level, class-leading fuel efficiency and a go-anywhere, do-anything capability that fits the lifestyles of active families, the 2015 Honda Pilot goes on sale today with a manufacturer's suggested retail price (MSRP) starting at $29,8701. Honda's renowned engineering excellence and quality combine to produce a practical and versatile three-row, eight-passenger family SUV with a class-leading EPA highway fuel economy rating2 of 25 mpg (2WD models) and towing capacity3 of a 4,500 pounds (4WD models). Add a low cost of ownership and five feature-rich trim levels and the 2015 Pilot is the "Ultimate Family Adventure Vehicle." New for 2015, the Pilot Special Edition (SE) is positioned between the EX and EX-L trim levels and includes sporty pewter gray aluminum alloy wheels, special SE badging, a one-touch-open power moonroof with tilt feature, Sirus XM radio and a Honda DVD Rear Entertainment System. Standard features on all 2015 Pilots include remote entry, rearview camera and an integrated Class III trailer hitch. All 2015 Pilots are powered by a refined and fuel-efficient 250-horsepower4 3.5-liter i-VTEC V-6 engine with Variable Cylinder Management™ (VCM™). The engine is paired with a five-speed automatic transmission with Grade Logic Control to help maintain the most appropriate gear when climbing or descending steep grades. All trims are available with 2-wheel drive or with Honda's Variable Torque Management® 4-wheel-drive system (VTM-4®) that adds fully automatic 4-wheel-drive capability and features a "lock mode" that can deliver the maximum-possible torque transfer to the rear wheels to aid extraction from extremely low traction or stuck conditions. The Pilot's powertrain is complemented by a rigid body structure and fully independent suspension – with MacPherson strut front and multi-link with trailing arm rear – that provides the foundation for its responsive handling and comfortable ride. These traits are complemented by chassis geometry producing impressive cornering capability and easy maneuverability in tight parking situations. The Honda Pilot was designed and engineered at Honda's R&D facilities in California and Ohio, and is built exclusively by Honda Manufacturing of Alabama5. View, build and price a 2015 Honda Pilot at automobiles.honda.com/pilot. Consumer information is available at http://automobiles.honda.com/pilot. To join the Pilot community on Facebook, visit https://www.facebook.com/hondapilot. Additional media information including detailed pricing features and high-resolution photography of the 2015 Honda Pilot is available at http://hondanews.com/channels/honda-automobiles-pilot. 1 MSRP excluding tax, license, registration, $830.00 destination charge and options. Dealer prices may vary. 2 Based on 2015 EPA mileage ratings. Use for comparison purposes only. Your actual mileage will vary depending on how you drive and maintain your vehicle. 3 Maximum towing capacity for 4WD models is 4,500 lbs. Premium unleaded fuel is recommended when towing above 3,500 lbs. Maximum towing capacity for 2WD models is 2,000 lbs. Towing requires the addition of the Honda accessory towing kit, trailer harness and hitch ball. Trailer harness is standard on Touring models. Please see your Honda dealer for details. 4 250 horsepower @ 5,700 rpm (SAE net). 5 Using domestically and globally sourced parts.